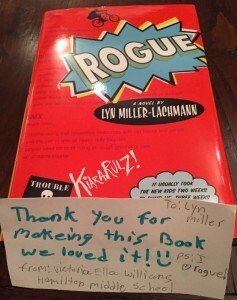 In 2015 Rogue was selected as the One Book, One School read at Alexander Hamilton Middle School in Houston, Texas, as well as a finalist for the Truman Award, a state award for Missouri. I spoke to assemblies and Skyped in to classrooms and libraries. Various libraries chose the novel for summer reading programs, and I received a number of letters and photos of fan art. Because many of the kids and adults writing in asked similar questions, I decided to answer one question each month for 2016. The most common question was “Will Rogue have a sequel?” and I answered it in my last post. (I also answered it twice in the “question of the month” feature, with a different response each time.) These are some of the others, with my answers, updated answers, and a couple of new questions that I’ve received since. I thank everyone writing in, or speaking to me in person, for your support of this book. You have encouraged me to move forward with a new edition that will bring Kiara’s story to a new generation of readers. Fan art by Marie June. Used with permission. When does Rogue take place? Update: I’ve thought about changing the time period in the new edition, but 2006 was the height of the meth epidemic and the year the U.S. Congress passed a law requiring Sudafed to be pulled from shelves and placed behind pharmacy counters. Where does Rogue take place? A medium-sized town in northeastern Connecticut. That part of Connecticut is known as the “quiet corner” because it’s much less urbanized than the rest of the state and is more like rural communities elsewhere in the U.S.
Gringolandia and Surviving Santiago have many of the same characters. Do any of the characters in Rogue show up in other books you’ve written? Yes. Antonio, then known as Tony, is a character in my adult novel Dirt Cheap, which was published by Curbstone Press (the publisher of Gringolandia) in 2006. Are any of the characters in Rogue based on your own children? No. Kiara is based on me, and the other characters are based on people I knew growing up. Have you ever been on Tonight with Jimmy Fallon? No, and I’m kind of glad because I get really nervous in front of the camera. The last time someone recorded me, they had to do it five times to get it right because I kept looking in the wrong direction. An interview for Papá’s radio show, “Oye, Nino.” Scene from Surviving Santiago. Why did Kiara want to be popular? Great question! I have a longer answer on my blog, but the short answer is this: She saw the popular kids having a lot more fun than she was having, and she wanted what they had. 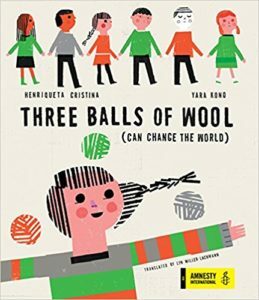 Do you have other recommendations for books featuring kids on the autism spectrum? One of my favorite books of 2016 is Corinne Duyvis’s On the Edge of Gone. I normally don’t read post-apocalyptic fiction, but she captures the setting and her autistic protagonist perfectly. I like how she challenges a society that only judges people by what they can produce rather than valuing them as human beings. Update: I’ve written a blog post about three books that have come out since I answered this question. All of them feature autistic protagonists who are diagnosed and live in communities where they receive support from family, friends, and caring adults. At the end of Rogue, Kiara is diagnosed and finds that community, but not all autistic people do. These books model what a supportive environment looks like. 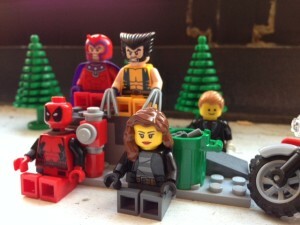 Lego minifigures illustrate a scene from the unpublished novel ANTS GO MARCHING. 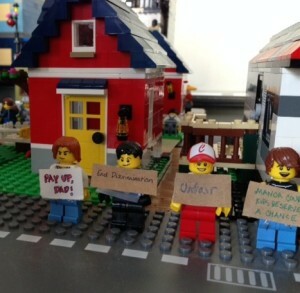 Does your Lego town appear in any of your books? Not yet, although I have scenes in my town that correspond to scenes in Rogue, Surviving Santiago, and one of the unpublished books, ANTS GO MARCHING. After Rogue came out, I donated its scene and characters to a fundraising auction, so I don’t have it anymore. However, I still have the radio station where Cristina’s father works in Surviving Santiago. 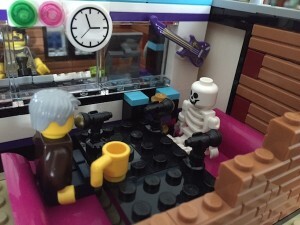 It was my first modular MOC (My Own Creation), and I have minifigures for the different characters as well. Do you have autistic characters in any of your other novels? Besides Rogue, I don’t have autistic characters in my published novels, though I do have one disabled character who appears in both Gringolandia and Surviving Santiago — Daniel and Cristina’s father, who has a traumatic brain injury and PTSD from torture during the Pinochet dictatorship in Chile. 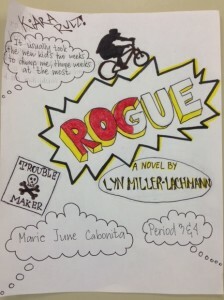 I have four unpublished YA novels and two MG novels finished or in progress, all of which I’ve written since Rogue. One of the four YA novels has an autistic protagonist, one of three main characters who become a collective protagonist in the course of the story. Both of the middle grade novels feature an autistic protagonist who loves building with Lego. However, I’ve set one of those projects aside and incorporated elements into the other one. Great questions from your readers! I hope looking back at them has been encouraging for you, Lyn. The world needs more of Rogue. Thank you! I feel that by keeping it in print myself I’m kind of forcing myself on the canon, but if I don’t do it, who will?